Most knowledge graphs have an orientation to things and concepts, what might be called the nouns of the knowledge space. Entities and concepts have certainly occupied my own attention in my work on the UMBEL and KBpedia ontologies over the past decade. In Part I of this series, I discussed how knowledge graphs, or ontologies, needed to move beyond simple representations of things to embrace how those things actually interact in the world, which is the understanding of context. What I discuss in this part is how one might see actions and events in a way that has logic and coherency. What I discuss in this part is an event-action model. As we all know, knowledge statements or assertions are propositions that combine a subject with a predicate. Those predicates might describe the nature or character of the subject or might relate the subject to other objects or situations. For covering this aspect we need to pay close attention to the verbs or relations that connect these things. How we model or represent these things is one of the critical design choices in a knowledge graph. But these choices go beyond simply using RDF or OWL properties (or whatever predicate basis your modeling language may provide). Modeling relations and predicates needs to capture a worldview of how things are connected, preferably based on some coherent, underlying rationale. Similar to how we categorize the things and entities in our world, we also need to make ontological choices (in the classic sense of the Greek ontos, or the nature of being) as to what a predicate is and how predicates may be classified and organized. As I noted in Part I, much less is discussed about this topic in the literature. Information and information theory have been my passion my entire professional career. In that period, two questions stand out as the most perplexing to me, each of which took some years to resolve to some level of personal intellectual satisfaction. My first perplexing question was how to place information in text on to a common, equal basis to the information in a database, such as a structured record. (Yeah, I know, kind of a weird question.) These ruminations, now what we call being able to place unstructured, semi-structured and structured information on to a common footing, was finally solved for me by the RDF (Resource Description Framework) data model. But, prior to RDF, and for perhaps a decade or more, I thought long and hard and read much on this question. I’m sure there were other data models out there at the time that could have perhaps given me the way forward, but I did not discover them. It took RDF and its basic subject-predicate-object (s-p-o) triple assertion to show me the way forward. It was not only a light going on once I understood, but the opening of a door to a whole new world of thinking about knowledge representation. My second question is one that has been gnawing at me for at least five or six years. The question is, What is an event? (Yeah, I know, another kind of weird question.) When one starts representing information in a knowledge graph, we model things. My early ideas of what is an entity is that it was some form of nameable thing. By that light, the War of 1812, or a heartbeat, or an Industrial Age are all entities. But these things are events, granted of greatly varying length, that are somehow different from tangible objects that we can see or sense in the world, and different from ideas or thoughts. These things all differ, but how and why? Actually, the splits noted in the prior paragraph give us this clue. Events are part of time, occupy some length of time, and sometimes are so notable as to get their own names, either as types or named events. They have no substance or tangibility. These characteristics are surely different than tangible objects which occupy some space, have physicality, exist over some length of time, and also get their own names as types or named instances. And both of these are different still than concepts or ideas that are creatures of thought. These distinctions, mostly first sensed or intuited, are hard to think about because we need a vocabulary and mindset (context) by which to evaluate and discern believable differences. For me, the idea and definition of What is an event? was my focus and entry point to try to probe this question. Somehow, I felt events to be a key to the very structures used for knowledge representation (KR) or knowledge-based artificial intelligence (KBAI), which need to be governed by some form of conceptual schema. In the semantic Web space, such schema are known as “ontologies”, since they attempt to capture the nature or being (Greek ὄντως, or ontós) of the knowledge domain at hand. Because the word ‘ontology’ is a bit intimidating, a better variant has proven to be the knowledge graph (because all semantic ontologies take the structural form of a graph). In Cognonto‘s KBAI efforts, we tend to use the terms ontology and knowledge graph interchangeably. A key guide to this question of What is an event? are the views of Charles Sanders Peirce, the great 19th century American logician, polymath and philosopher. His theory of the universal categories — what he termed Firstness, Secondness and Thirdness — provides the groundings for his views on logic and sign-making. As we’ve noted before about KBpedia, Peirce’s theory of universal categories greatly informs how we have constructed it . Peirce’s categories, while unique, are an organizational framework not unlike categories of being put forward by many philosophers; see  for more background on this topic. Thus, with liberal quotes from Peirce himself , I work through below some of the background context for how we treat events — and related topics such as actions, relations, situations and predicates — in our pending KBpedia v 150 release. Of course, I am hardly raising new questions. The philosophical question of What is an event? is readily traced back to Plato and Aristotle. The fact we have no real intellectual consensus as to What is an event? after 2500 years suggests both that it is a good question, but also that any “answer” is unlikely to find consensus. Nonetheless, I think through the application of Peircean principles we can still find a formulation that is coherent and logically consistent (and, thus, computable). Within the context of current knowledge bases, the Cyc knowledge base, for example, asserts situations are a generalization of events, and actions are a specialization of events. Most current semantic Web ontologies place events in the same category or class as entities. Some upper ontologies model time in a different way by viewing objects as temporal parts that change over time, or other dichotomous splits around the questions of events and actions. Like I said, there is really no consensus model for events and actually little discussion of them. Events, if sufficiently notable, can be properly named (World War II). We often look for causes for events, but Peirce cautions us that, “Men’s minds are confused by a looseness of language and of thought which leads them to talk of the causes of single events. They ought to consider that it is not the single actuality, in its identity, which is the subject of a law, but an ingredient of it, an indeterminate predicate. Consequently, the question is, not whether each and every event is precisely caused, in one respect or another, but whether every predicate of that event is caused.” (EP p 396) Peirce notes that the chance flash or shock, say a natural phenomenon like a lightning strike or an accident, which by definition is not predictable, can itself through perception of or reaction to the shock “cause” an event. Chance occurrences are a central feature in Peirce’s doctrine of tychism. Nonetheless, “Individual objects and single events cover all reality . . . .” (CP 5.429). Other possibly useful statements by Peirce regarding events may be found under . In these regards, we can see both entities and single events as individual instances within our KBpedia Knowledge Ontology, what we call Particulars, which represent the second (or Secondness) of the three main branches in KKO. Per our use of the universal categories to evaluate our subsequent category structures (see ) within Particulars, events are treated as a Secondness due to their triggering and “quasi-existence” nature, with entities treated as a Thirdness . Like entities, we can also generalize events into types, which are placed under the third main branch of KKO, the Generals. Event types can be defined and are real in a similar way to entity types. 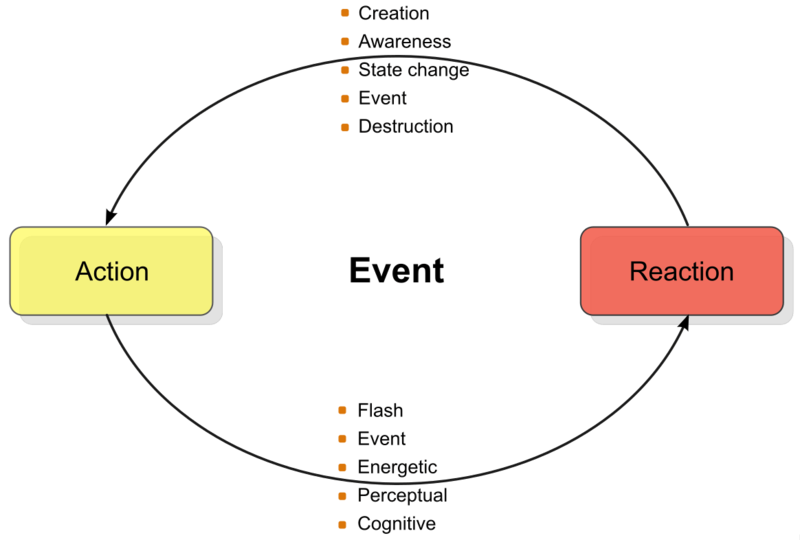 Within events, we can also categorize according to the three universal categories. What I present below are comments with respect to the event examples first mentioned in the introductory material above. As noted, the chance event, the unexpected flash or shock, is a Firstness within events. Peirce’s doctrine of tychism places a central emphasis on chance, being viewed as the source of processes in nature such as evolution and the “surprising fact” that causes us to re-investigate our assumptions leading to new knowledge.”Chance is any event not especially intended, either not calculated, or, with a given and limited stock of knowledge, incalculable.” (CP 6.602 ref). The surprising fact is the spark that causes us to continually reassess the nature of the world, to assess and categorize anew . We more commonly associate an event with action, and that is indeed a major cause of events. (Though, as we saw, chance events or accidents, as an indeterminate group, may trigger events.) An action is a Secondness, however, because it is always paired with a reaction. Reactions may then cause new actions, itself a new event. In this manner activities and processes can come into being, which while combinatorial and compound, can also be called events, including those of longer duration. That entire progression of multiple actions represents increasing order, and thus the transition to Thirdness. So, we see that actions can be triggered by chance, energetic effort, perceptions, and reactions to prior actions, sometimes cascading into processes involving a chain of actions, reactions and events. Peirce makes the interesting insight that thoughts are events, too. “Now the logical comprehension of a thought is usually said to consist of the thoughts contained in it; but thoughts are events, acts of the mind. Two thoughts are two events separated in time, and one cannot literally be contained in the other.” (CP 5.288) Similarly, in “Law of the Mind” Peirce calls an idea “an event in an individual consciousness” (CP 6.105) Through these assertions, the sticky question of thinking and cognition (always placed as a Thirdness by Peirce) is clearly put into the event category. Of course, the essence of Thirdness is continuity, what Peirce called synechism. The very nature of continuity in a temporal sense are events, some infinitesimal, transitioning from one to another, with breaks, if we are to become aware of them, merely breaks in the continuity of time. Entities, at least as we define them, provide a similar function, but now over the continuity of space. All objects are deformations of continuous space. By this neat trick of relating events to time and entities to space, all of which is (yes, singular tense) continuous, Peirce nailed one of the hard metaphysical nuts to crack. Some claim that Peirce was the first philosopher to anticipate the space-time continuum . In triadic action, the classic example is ‘A gives B to C’ (EP 2 170-171). The other classic triadic example is Peirce’s sign relation between object, sign and interpretant. Peirce adopted the term semiosis for this triadic relation and defined it to mean an “action, or influence, which is, or involves, a coöperation of three subjects, such as a sign, its object, and its interpretant, this tri-relative influence not being in any way resolvable into actions between pairs” (EP 2 411). Peirce’s reduction thesis also maintains that all higher order relationships (polyadic with more than three terms) can be decomposed to monadic, dyadic or triadic relations. All three are required to capture the universe or potential relations, but any relation can be reduced to one of those three . Further, Peirce also maintained that the triadic relation is primary, with monadic and dyadic relations being degenerate forms of it. Now, all symbols (therefore, also the basis for human language) are also a Thirdness. The symbol (sign) stands for an object which the interpretant understands to have a meaning relationship to the object. Symbols, too, may be causes of events. As Peirce states,”Thus a symbol may be the cause of real individual events and things. It is easy to see that nothing but a symbol can be such a cause, since a cause is by its definition the premiss of an argument; and a symbol alone can be an argument.” (EP, p 317). It is not always easy to interpret Peirce. The ideas of creation and destruction, for example, would seem to be elements of Firstness, being closely allied to the idea of potentiality. Yet, as Peirce states, “But the event may, on the other hand, consist in the coming into existence of something that did not exist, or the reverse. There is still a contradiction here; but instead of consisting in the material, or purely monadic, repugnance of two qualities, it is an incompatibility between two forms of triadic relation . . . .” (CP 1.493) This statement seems to suggest that creation and destruction are somehow related to Thirdness. It is not always easy to evaluate where certain concepts fit within Peirce’s universal categories. While I am unsure of some aspects of my Peircean analysis as to exact placements into Firstness, Secondness and Thirdness, what is also true is that Peirce sets conditions and mindsets for looking at these very questions. Ultimately open questions such as I mention are amenable to analysis and argumentation according to the principles underlying Peirce’s universal categories of Firstness, Secondness and Thirdness. The challenge is not due to the criteria for evaluation; rather, it comes from probing what is truly meant and implied within any question. The single event may arise from any of the bulleted items shown on this diagram. Though every action is paired with a reaction, one or the other might be more primary for different kinds of events. As Peirce notes, the event represents a juxtaposition of states, the comparison of the subject prior and after the event providing the basis for the nature of the event. Each change in state represents a new event, which can trigger new actions and reactions leading to still further events. Simple events represent relatively single changes in state, such as turning off a light switch or a bolt of lightning. More complicated events are the topic of the next section. 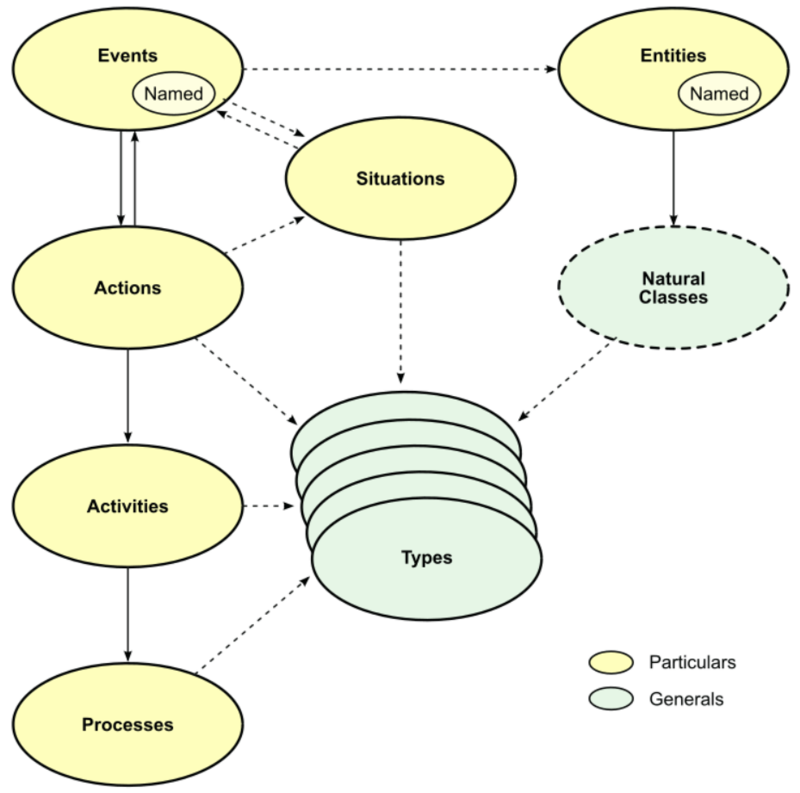 On the left-hand portion of the diagram we have the cascade from events to actions to activities and then processes. The progression down the cascade requires the chaining together of events and actions and paired reactions, getting more ordered and purposeful as we move down the cascade. Of course, single events may trigger single actions and reactions, and events express themselves at every level of the cascade. Events and actions always occur in a situation, the context of which may have influence on the resulting nature of the event and its actions and reactions. This mediation is the exact reason that Thirdness is a logical foundation. Parallel with events are entities, which themselves result from events. Entities, too, may be named. This side of the diagram cascade leads to classes or types of individual entities, which now become generals, and that may be classified or organized by types. A similar type aggregation may be applied to individual events, actions, activities and processes. At this point, we are moving into the territory of what is known as Peirce’s token-type distinction (particulars v generals). With generals, we now move beyond the focus of events; see further my own typology piece for this transition . Events are like the spark that leads us to better understand actions and what emerges from them, which in turn helps us better understand predicates and relations. These are topics for next parts in this series. What we learn from Peirce is that events are quasi-entities, based on time rather than space, and, like entities, are a Secondness. Like entities, we can name events and intrinsically inspect their attributes. Events may also range from the simple to the triadic and durative. Events are the fundamental portions of activity and process cascades, and also capture such seemingly non-energetic actions like thought. Thought, itself, may be a source of further events and action, as may be the expressions of our thought, symbols. And actions always carry with them a reaction, which can itself be the impetus for the next action in the event cascade. What this investigation shows us is that events are the real triggering and causative factors in reality. Entities are a result and manifestation of events, but less central to the notion of relations. Events, like entities, can be understood through Peirce’s universal categories of Firstness, Secondness and Thirdness. Events help give us a key to understand the dynamic nature of Charles Peirce’s worldview. I hope in subsequent parts of this series to help elucidate further how an understanding of events helps to unmask the role and purpose of relations. Though entities, events and generals may all be suitable subjects for our assertions within knowledge bases and knowledge graphs, it is really through the relations of our system, in this case KBpedia, where we begin to understand the predicates and actions of our chosen domain. 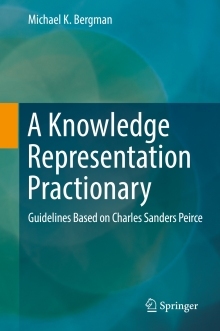 This series on KBpedia relations covers topics from background, to grammar, to design, and then to implications from explicitly representing relations in accordance to the principals put forth through the universal categories by Charles Sanders Peirce. Relations are an essential complement to entities and concepts in order to extract the maximum information from knowledge bases. This series accompanies the next release of KBpedia (v 150), which includes the relations enhancements discussed. M.K. Bergman, 2016. “The Irreducible Truth of Threes,” AI3:::Adaptive Information blog, September 27, 2016. Peirce citation schemes tend to use an abbreviation for source, followed by volume number using Arabic numerals followed by section number (such as CP 1.208) or page, depending on the source. For CP, see the electronic edition of The Collected Papers of Charles Sanders Peirce, reproducing Vols. I-VI, Charles Hartshorne and Paul Weiss, eds., 1931-1935, Harvard University Press, Cambridge, Mass., and Arthur W. Burks, ed., 1958, Vols. VII-VIII, Harvard University Press, Cambridge, Mass. For EP, see Nathan Houser and Christian Kloesel, eds., 1992. The Essential Peirce – Volume 1, Selected Philosophical Writings‚ (1867–1893), Indiana University Press, 428 pp. For EP2, see The Peirce Edition Project, 1998. The Essential Peirce – Volume 2, Selected Philosophical Writings‚ (1893-1913), Indiana University Press, 624 pp. Roberto Casati and Achille Varzi, 2014. “Events“, Stanford Encyclopedia of Philosophy, Aug 27, 2014. Retrieved May 2, 2017. “A Sinsign (where the syllable sin is taken as meaning “being only once,” as in single, simple, Latin semel, etc.) is an actual existent thing or event which is a sign. It can only be so through its qualities; so that it involves a qualisign, or rather, several qualisigns. But these qualisigns are of a peculiar kind and only form a sign through being actually embodied.” (EP Nomenclature of Triadic; p 291) That is, a sinsign is either an existing thing or event; further, events have attributes. “Another Universe [Secondness] is that of, first, Objects whose Being consists in their Brute reactions, and of, second, the facts (reactions, events, qualities, etc.) concerning those Objects, all of which facts, in the last analysis, consist in their reactions. I call the Objects, Things, or more unambiguously, Existents, and the facts about them I call Facts. Every member of this Universe is either a Single Object subject, alike to the Principles of Contradiction and to that of Excluded Middle, or it is expressible by a proposition having such a singular subject.” (EP p 479) The latter is an event. Under Particulars, the instantiation of qualities (making them subjects as opposed to unformed potentiality) is the Firstness. See, for example, A. Nicolaidis, 2008. “Categorical Foundation of Quantum Mechanics and String Theory,” arXiv:0812.1946, 10 Dec 2008. It is not unusual to see grand claims for the foresight exhibited by Peirce in his writings, which sometimes have an inadequate basis for the claims of prescience. However, Peirce’s general observations often pre-date current, modern interpretations, even if not fully articulated. M.K. Bergman, 2016. “Threes All the Way Down to Typologies,” AI3:::Adaptive Information blog, October 13, 2016. How we model or represent relations is one of the critical design choices in a knowledge graph. In this Part II of our ongoing series on KBpedia relations, we discuss the event-action model underlying our characterization of direct relations. Much of this part relies on the writings of Charles Sanders Peirce. Interesting. Though, it seems to me that an event is less dependent on Time and acts more like a sequence of 1 or more state changes. One of the most quantifiable events is the execution of a computer instruction code as described by the Von Neumann architecture of #1 instructions + #2 memory. Therefore, when theorizing of events in a knowledge base. You have Named Event Entities — yes. Or, an event as a model — such as a Finite State Machine (one or more entities) — but the most interesting form of an event (or basic action) is that an event arises as a Turing machine computes (worldly state changes) and modifies (state changes) a knowledge graph.